Fear and need are the underlying principle for most of my observations. I know this rationale often raises more questions than it answers, so more clarification is in order. Not that I haven’t tried before… see Fear is the Bottom Line and One who speaks does not know? Well, third time’s the charm, right? On the surface, life is very much like the surface of the sea, from roiling waves to calm ripples. The depths, on the other hand, have a profound sameness(1) about them. Likewise, plunging deeper in life offers a profound sameness in perception. Chapter 40 plunges down, revealing the key role fear and need play in life. Fear: Note the reference to “loss” and “death” in chapter 40 above. If you plunge down to your subtlest sense of fear, you will find some sense of “loss”. We instinctively fear “loss”. Every “loss” we sense, regardless of how minor, evokes within us a subtle sense of virtual “death”. The survival instinct engenders within us a countervailing visceral need to hold on and have. Need: Note the references to “having” in chapter 40 above. The opposite of “loss” is gain, and the consequence of gain is “having”. The shear act of living results in a gaining to have. This drives life inexorably in the opposite direction of entropy (loss and ‘death’ of order). Each life dedicates itself to “having” what it feels it needs to survive. This moves “in the opposite direction, of the way moves”. We can infer this from the last line, “Having is born in nothing”. The penultimate of “loss” is “nothing”. Life’s innate deep-seated “fear” of “loss and death” (‘nothingness’) drives it to need and have. Does this make any sense? I feel my effort to elucidate chapter 40’s link to fear and need can just as easily hinder understanding. Even so, perhaps it might help by redirecting attention back to the more pithy account stated in chapter 40. I use the terms need and fear to convey, in the broadest possible sense, the primal biological driving forces of life. Feeling need (of food, sleep, social connection, etc.) attracts us to what ostensibly facilitates survival. Feeling fear (looming loss of what we have and cherish) repels us from what ostensibly impedes survival. Such need and fear are often below the threshold of thought — ‘subthought’ — and only evoke conscious thoughts once they pass a certain threshold. I trust that you can see I’m referring to forces that lie at the root of instinct itself, and not any particular manifestation, be that anything from subtle insecurity to fleeing in screaming terror. In addition, the dynamic expressed in chapter 40 extends to all creation, not merely living things. Thinking animals like Homo sapiens here on earth, must deal with what are still the severely under-appreciated consequences of their intelligence. Chapter 71 certainly speaks to this issue: Realizing I don’t’ know is better; not knowing this knowing is disease. I’m breaking this all down to show the blinding influence that need and fear have upon thought. If taken to heart, the admonition to “just let go of desire” or “just don’t worry about it” are impossible platitudes unworthy of the breath it takes to express them! If taken seriously, this breakdown also helps maintain a more constant realization that “I don’t know”. That is, whenever you feel emotion currents tugging within, you can be certain irrationality has overtaken your mind, and you are only seeing what you need or fear to see. Merely maintaining some peripheral sense that Need + thinking = Desire and that Fear + thinking = Worry can serve as a kind of ‘canary in the mind’ to alert you of impending danger. How does profound sameness apply to need and fear? Some things are too obvious to see clearly. I suppose ‘profound sameness’ fits that description. At some point, I began to suspect that the underlying cause of need was fear, yet I couldn’t see the connection clear enough to understand how that could be. This exemplifies how we only understand what we know. The feeling was the beginning of an intuitive knowing that took some years more to understand cognitively. Take the idea that worry is simply fear + thought. 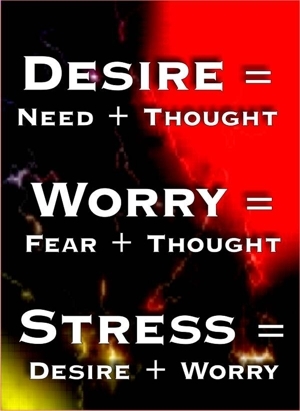 The emotion of fear evokes corresponding thoughts, and worries are born. When we begin to worry about something, we soon feel a need to find a solution… a way to leave the worry behind. Simply put, fear summons the need for a solution. Fear also drives the need to control. Helping others is one way we control other people in a ‘helpful’ socially acceptable way. I imagine making the connection between helping, the need to control, and fear may be a stretch. It may help to consider the old adage, “The road to hell is paved with good (a.k.a. ‘helpful’) intentions” for hints at how this connection plays out in the world. The link between fear and need makes more sense if we stipulate that Mother Nature is efficient and wastes nothing. Indeed, nature doesn’t ‘abhor a vacuum’, but rather makes use of the vacuum… emptiness… nothingness. Again, Having is born in nothing. Think of fear as the essential building block of life. The life process uses fear to co-generate need as a way to keep living things moving and having. Need incorporates the illusion that satisfying the hunger born of emptiness will relieve the fear of emptiness. However, emptiness born of entropy always returns. Fear needs resolution; need fears emptiness and loss; and ‘loss through death’ is a universal constant. No wonder life feels like a vicious circle at times. The closer I look, the more fear and need are indistinguishable. I’ve often heard bickering over the existence of God; does ‘he’ exist or not. Those that say yes, need to believe in God. The belief assuages some of the fear of the unknown we naturally feel. Folks who say God doesn’t exist, don’t share that need. Yet they have an aversion (fear) of other people believing in God. They need believers to ‘wake up’; the believers need non-believers to ‘wake up’. Naturally, all this applies to anything over which we bicker. Good question Theresa, though I doubt that I could really say. In a sense, fear is primordial. Its currents ebb and flow at the root of life, survival, existence. As to specific fears: Certainly, any circumstance that threatens what I’m holding on to, certainly stirs up fear. Age mitigates that somewhat as life compels me to let go more. There are also, for example, innate social needs which correspond to deep-seated fear. These are set in instinct in order to make us a social species, but self-survival instincts often pull us the other way. It’s life’s tug of war. There is also a core instinct to optimize security and comfort; any threat of loss here will stirs up fear and need. However, even when all is at peace, I still sense the ‘void’… an existential weirdness, so to speak. That emptiness is the primary source for fear in all living things. I don’t know if ‘source’ is the right word. Perhaps it is best to think of fear as being an emergent property of Nothingness. There in you have the utility of the Buddhist and Taoist embrace of Emptiness… if you can’t fight ’em, join ’em. Speaking of “existential weirdness”, I doubt that would be much in play if I were a hunter-gather of old. Or rather, the further back in time that hunter-gather existence, the less ‘weirdness’ would be in play. I imagine a life fully integrated in the natural rhythms of wilderness existence (i.e., less security and comfort) would untangle most existential concerns. Of course, as long as there is a mind that thinks, there will be disconnection weirdness to some degree. Chapter 71 alludes to this human predicament: Realizing I don’t’ know is better; not knowing this knowing is disease. I’ve spent recent months considering what other people’s fears are. Of course other people’s fears are easier to view than are those fears I harbor. I have some answers and hope to elucidate next. Carl what is your most emotional fear?